This Friday, Dec. 5, 2008, at 9:30 Jean picked me up in Wallingford and we scooted to Olympia to sign some books in the Legislative Building’s little gift shop. We “worked” at this over lunch time, from eleven in the morning to one in the afternoon. 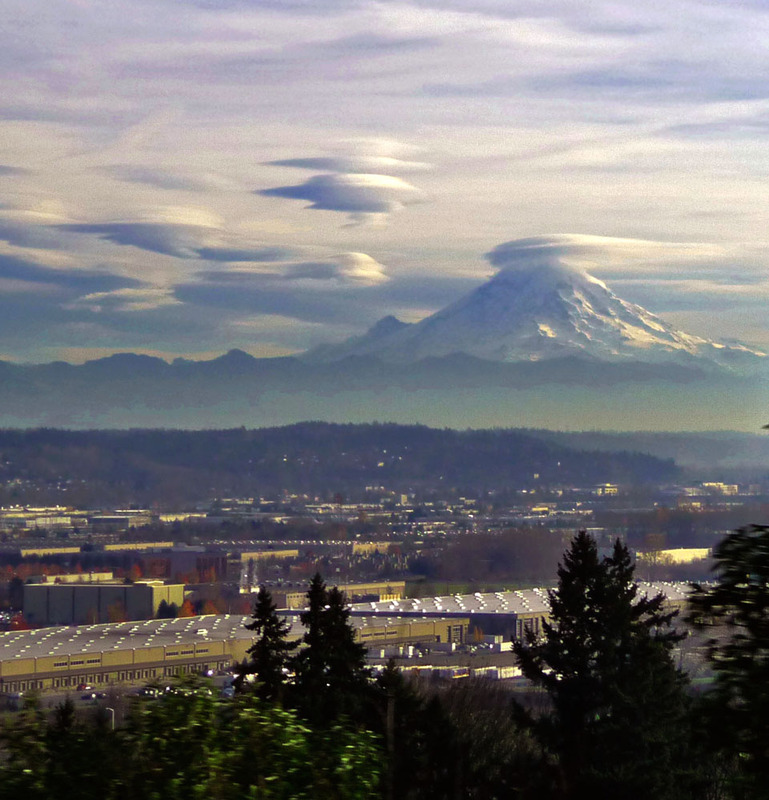 On our return to Seattle I took several photographs of Mt. 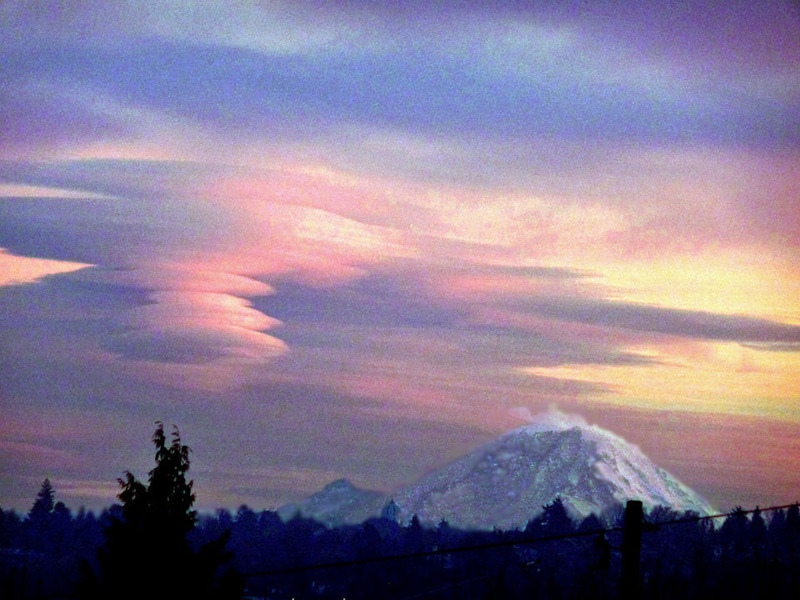 Rainier from the car window as it showed a most spectacular variation on the cloud cover that it often creates, it seems, for its own and our amusement . Sometimes this cover hovers like a beret. But the beret can swell into a hard hat and/or stretch into a sombrero. And on rare days, like this one, the clouds above the mountain and around it are as fanciful as the hatter’s examples sold at a theatre wardrobe sale. The first look was taken from the 1-5 bridge over the Puyallup River at about 1:45pm. This is The Mountain that the citizens of the “City of Destiny” ought to insist on lovingly calling Mt. Tacoma. The next recording looks south and a little east, again from I-5, and over Tukwilla’s Southcenter Mall – or near it around 2:10. Now the atmosphere about the mountain is dancing, and it has temporarily created a new cap. Around 3:00 I propped my Lummix against a signpost at the Wallingford Intersection of 42nd Street and 1st Avenue N.E.. 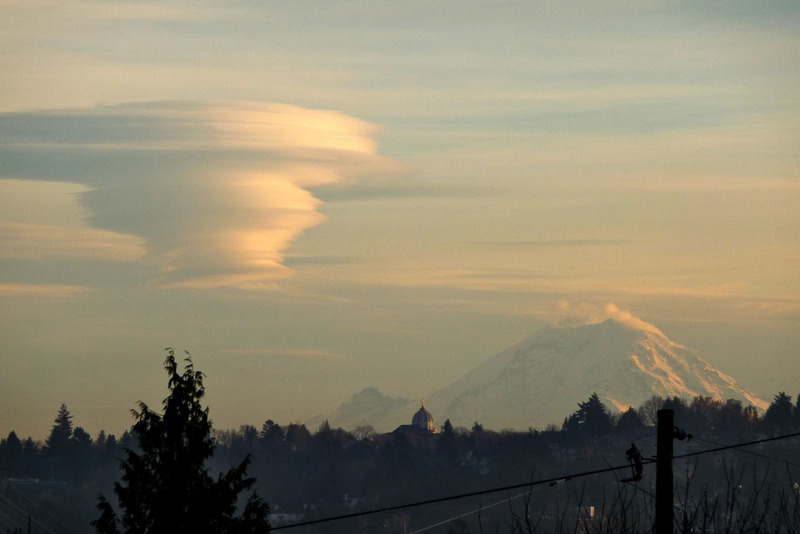 The high hat above the mountain has moved further east. 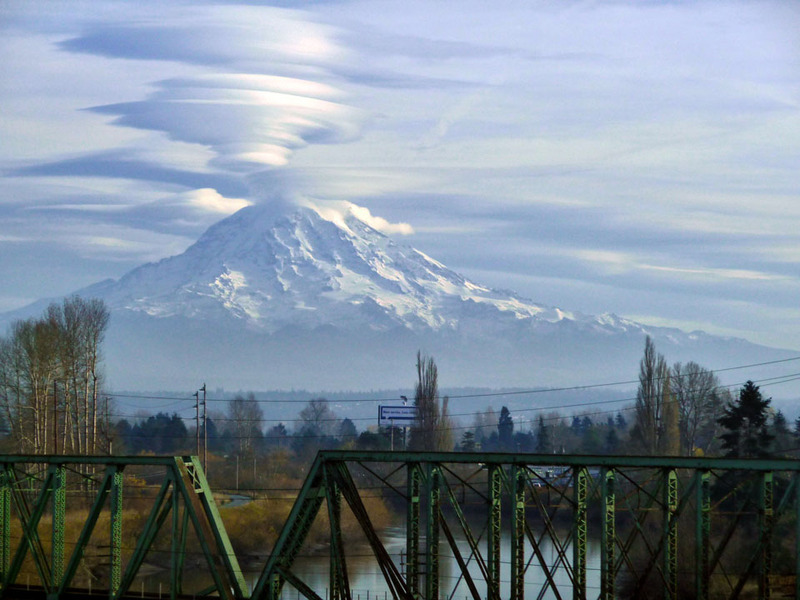 Earlier Jean noted that it seemed as massive as the mountain itself, although the reverse of it, like a wrapped Rainier standing on its head. Next the setting sun gives its typical rose glow to the mountain behind a dead tree given new life with blue bottles lovingly hung from its branches by sensitive neighbors. Moments later, with the sun below the Olympics, but not yet submerged in the Pacific, and with the camera wide open, the sky misses vespers for a riot. Damn, those are nice mountains!